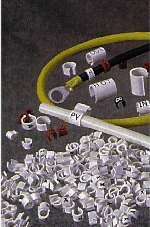 Flexible Sleeve Markers are designed to provide a permanent method of wire identification. The marker is installed before the termination is attached or solder connection made. 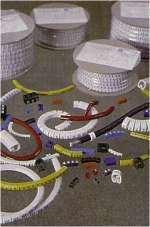 The accordion pleat "non-slip" grip expands to slip on the wire/cable and retracts to hold firmly in position. The same marker can be used for either right or left hand entry. Any number of markers, arranged in any sequence can be assembled to provide the necessary code. Hot stamped markings can't rub-off, fall-off, or peel-off. Markers allow for durable handling. Flexible Sleeve Markers are not sticky or messy. Installation is achieved without the aid of a tool. A rigid marker that will "snap-on" a wire/cable or tubing. These markers are specifically designed for applications after the termination has been make or solderless terminal has been attached.The marker's installation guide provides for easy application. The interior smooth design will not damage or pinch the wire/cable. ID Band Markers are designed to provide a permanent method of wire identification. The marker may be installed directly on a wide range of wire sizes (0.160" - 0.280") before end termination is made, or the Assembly Ribbon may be used to mount ID Band Markers on larger cable, conduit and tubing. The same marker may be used for either right or left hand entry. Any number of markers, arranged in any sequence, can be assembled to provide the necessary code. Large code markings are hot stamped into the plastic and provide visibility over great distances. Codes won't rub off, fall off or peel off.